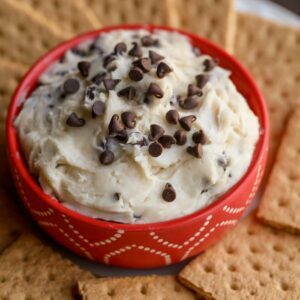 Chocolate Chip Dip - a simple, creamy delicious treat filled with mini chocolate chips and made with cream cheese, brown sugar, vanilla, butter, and powdered sugar. It's the perfect recipe for any party! Blend cream cheese and butter in a bowl until well combined. Add powdered sugar, brown sugar and vanilla. Mix well. Fold in mini chocolate chips and refrigerate for 1 hour. ENJOY!